This is it! I can finally declare I have a FAVORITE BAKERY! What a momentous occasion indeed. This is no fine French patisserie boasting macarons and dainty mousses layered upon crisp meringues nor is it your Manhattan Chinatown bakery with the most delightful $.50 sponge cakes and little baos filled with red bean paste. Oh no. This is Van’s Bakery. 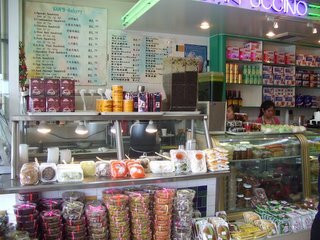 I’ve come here in the past with my aunt to pick up café su das (Vietnamese Iced Coffee) and pate soua (flaky pastries filled with spiced ground pork). 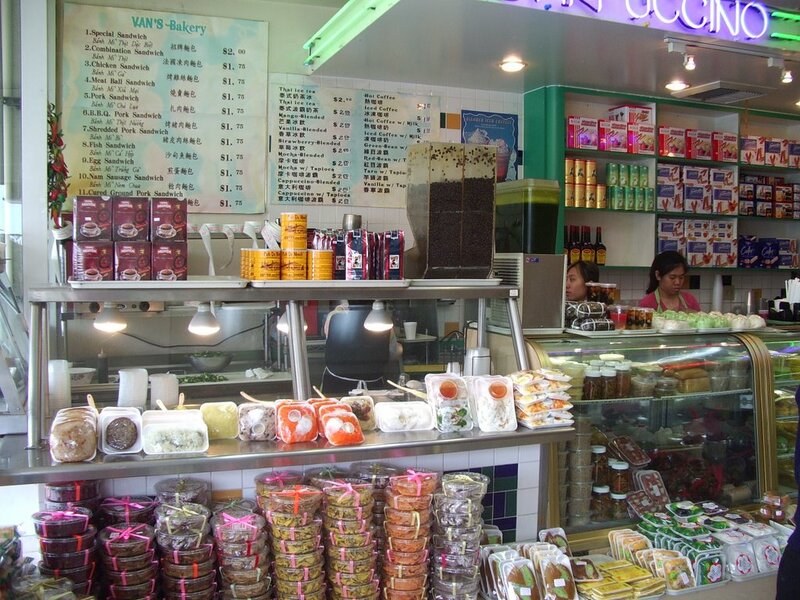 When we craved sweets, Van’s was our stop for a variety of che’s, a myriad of Vietnamese desserts based off beans, rice and most importantly, coconut milk. I did a post on Van’s a while back, but have only recently realized how crazy in love I am with this place. Every time I come there’s a bazillion things I’ve never seen, heard of or tried. I eat it all. And I love it all. 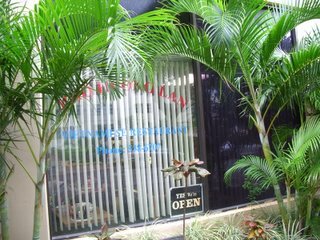 They specialize in Vietnamese desserts but also venture into “American Sweets” with fruit tarts and strawberry shortcakes – all of which are enjoyable in that Asian-nized (meaning not as sugary) American dessert way. 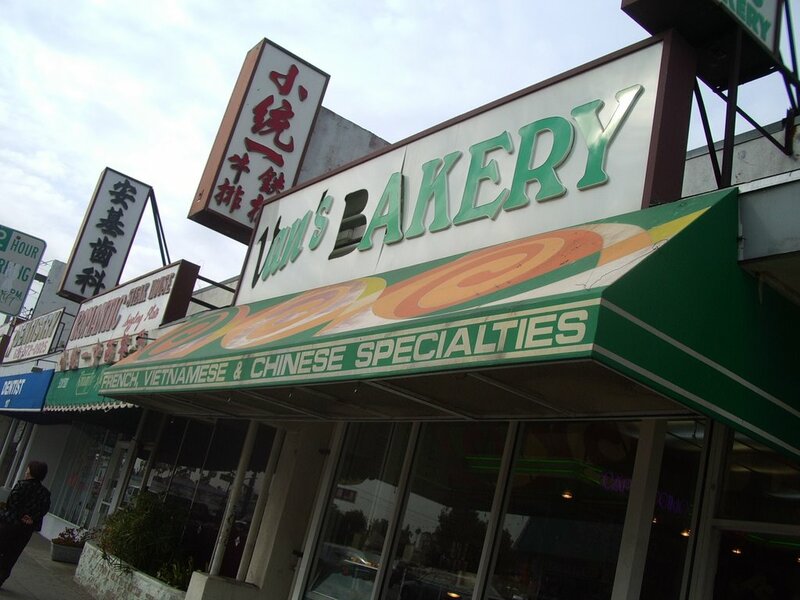 During special seasons they’ll fill the entire bakery with mooncakes or baos you never knew existed. It’s never boring! And always scrumptious. Banana and some kind of mysterious fruit tapioca with coconut milk. This mysterious fruit is similar to taro in terms of how it is used in desserts. I have no idea what it is called – but would eagerly accept any help! It is yellow in color and slightly grainy in texture. It is a firm fruit, easily peeled and cook while retaining it’s shape. 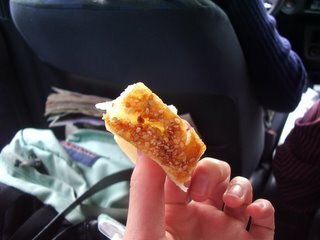 You can boil it into bits and mash it down to get the mochi-like sweet I had below. The banana & mystery fruit tapioca is a very common che and simple to make. Like the majority of Vietnamese desserts, the sweetness comes from fruit and the flavor from COCONUT. Ahhh! I love coconut. Coconut anything! Especially in hot liquid form. Mmm. This is the mochi dessert. I’ve posted on this before only I didn’t know that it was made with the same fruit in the che. So it’s like fruit mochi, only not fruity tasting? Ho boy, that must be pretty confusing. You see, this baffling fruit is not very sweet, more on the starchy side and with a thick, grainy, heavy on the carbs kinda feel. You just need to try it. It’s not as chewy as butter mochi but simply melts into a liquid mass on your tongue when hot. The Bao of my dreams. Could anything be more beautiful? A soft pandan flavor bao (still warm!) encased savory steamed pork with mushrooms, little chunks of carrots and peas. 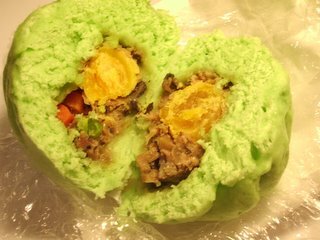 It in the heart of it was the elusive salty duck egg yolk that makes everything taste a million times better than it should. 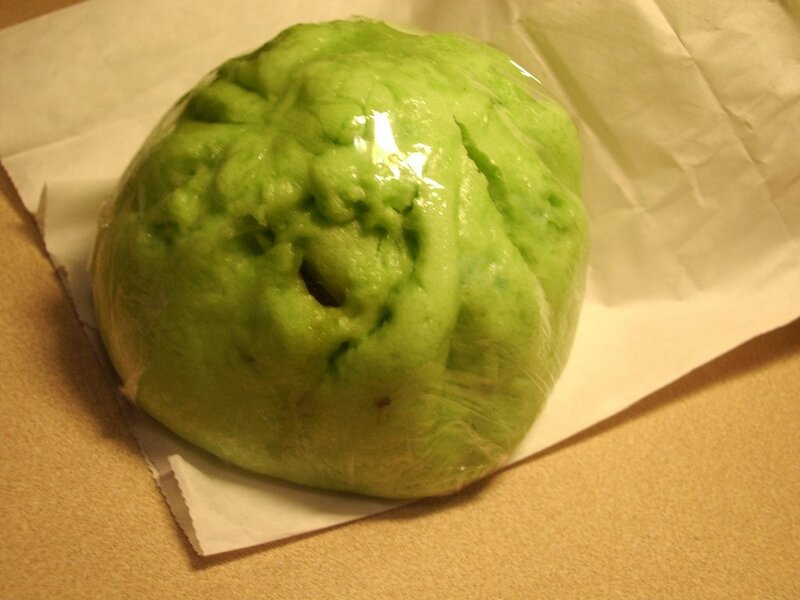 Don’t let the alarmingly green shade of the bun turn you off, think soft, milky dough with a slight sweet smoky flavor that you cannot quite put your finger on, but know it’s there…like umami – indescribable but you know it’s right. Sigh. Describing the flavor of many Asian tastes is really hard! I really admire all food bloggers who do such an excellent job, while I’m like “ahh, it’s just SO GOOD!” I tend to get too excited and forget to tell people how the item actually tastes. I apologize. But I love to eat! Again. No connection between the sentences. Just appreciate the enthusiasm. Sticky rice che with taro and sweetened coconut milk. Yes. Rice extends itself all the way from breakfast to dessert. The single most important food. Here, mochi rice is dyed and boiled down to a thick “jook” with cubes of taro. The thick, comforting mixture is sweetened with rock sugar and topped with warm coconut milk. 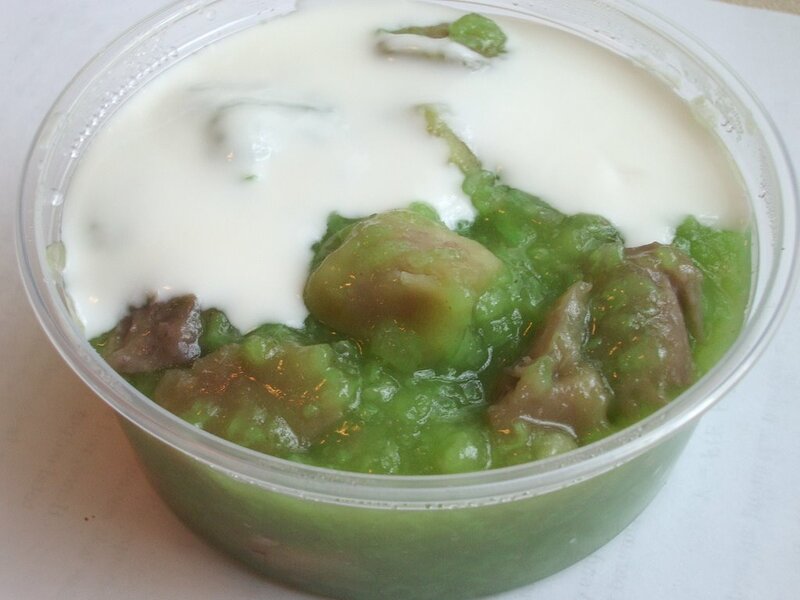 The che is traditionally eaten hot but is just fantastic cold for breakfast the next day. 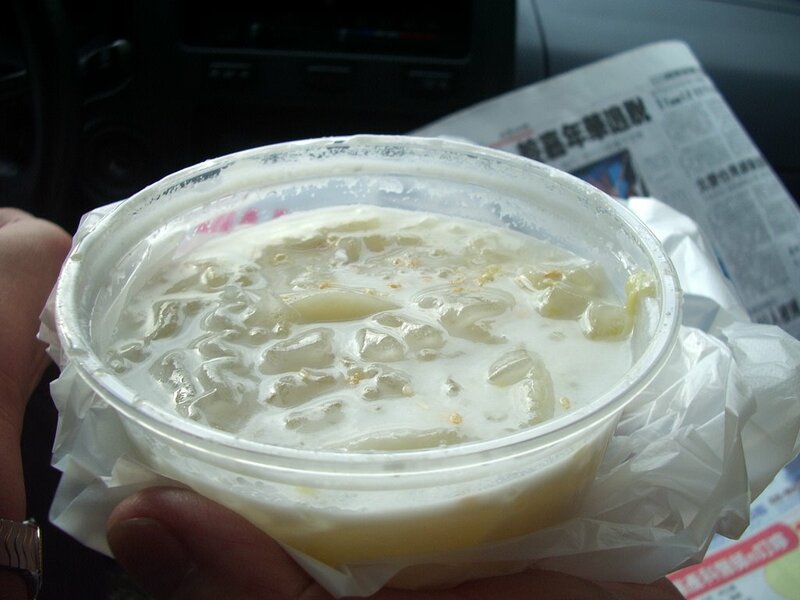 It would be a shame to leave without a cup of durian yogurt (they also make honeydew, taro and strawberry…but when durian’s an option, how can you refuse?!) It’s an ingenious dessert made from two simple ingredients: durian, condensed milk and water. 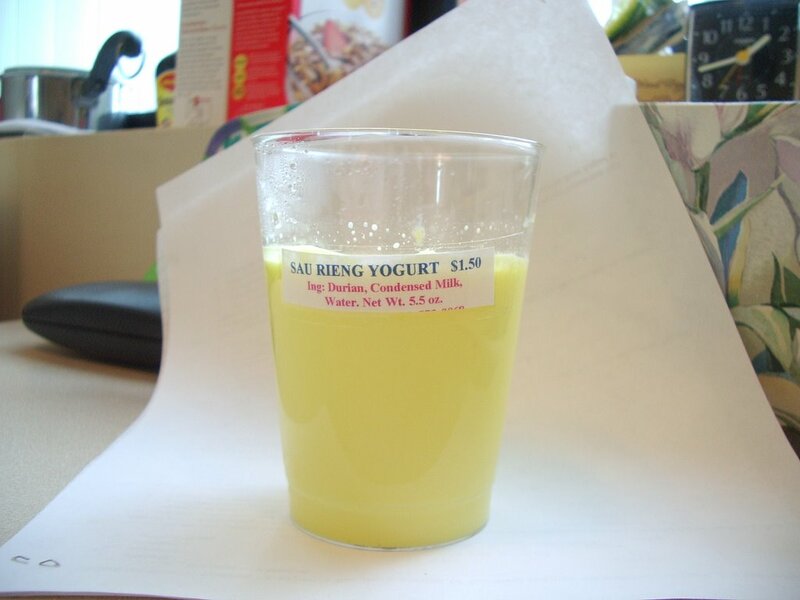 I don’t know what the heck they do with it (my mom used to make it when she was living in Vietnam – so I’ll go check with her) but the result is a wobbly, soft flan dessert tasting of pure durian. It’s pudding soft with a subtle hold, sweet only to the point of enhancing the creamy milky-ness of the durian. Do they process the fruit till it’s liquid or mash it down? Then boil the whole mass with condensed milk? Whatever they do, please continue do to so. I rarely crave burgers but always appreciate a nice toasty bun hugging a fair sized grilled patty, sauteed onions, tomatoes and lettuce piled high. My most memorable burger was at Burger Joint at Le Parker Meridian in NYC. Kua Aina back home does a mean avocado burger (and their fries are pretty damn awesome!) There are so many elements that determine what makes a good burger excellent and it many in fact have a lot to with the atmosphere. A dirty little spot hidden in the corner of an elaborate hotel, walking though the curtains of Burger Joint solicits a degree of secrecy. Greedily consuming a thick cheeseburger, medium-rare with juice spilling down the side of your hands in such at setting makes your actions seem out of place yet deliciously forbidden – enhancing the “burger experience.” Who would refuse a half pounder at our local Kua Aina, made better with a generous helping of buttery avocados and a side of salted crispy shoestring fries? Sitting outdoors with friends on a lazy Sunday afternoon, it isn’t hard to imagine that you would enjoy the burger more dining in the company of others than alone. I’m not quite sure what I’m getting at, but it seems to me, that in the case of burgers, ambiance and company play a key role. I have no desire to eat at In-N-Out alone but enjoy discovering a little bakery or devouring toasted challah and a bowl of hot borscht at B&H Dairy on my own. Burgers are a funny thing. I like to eat them, but not alone. But aside from burgers, I actually prefer eating alone! Not alone alone. But as a single diner in a restaurant where I can observe people or strike up conversations with strangers. I don’t know if that’s good/bad – but it always makes my day much more interesting. We can leave it at that. 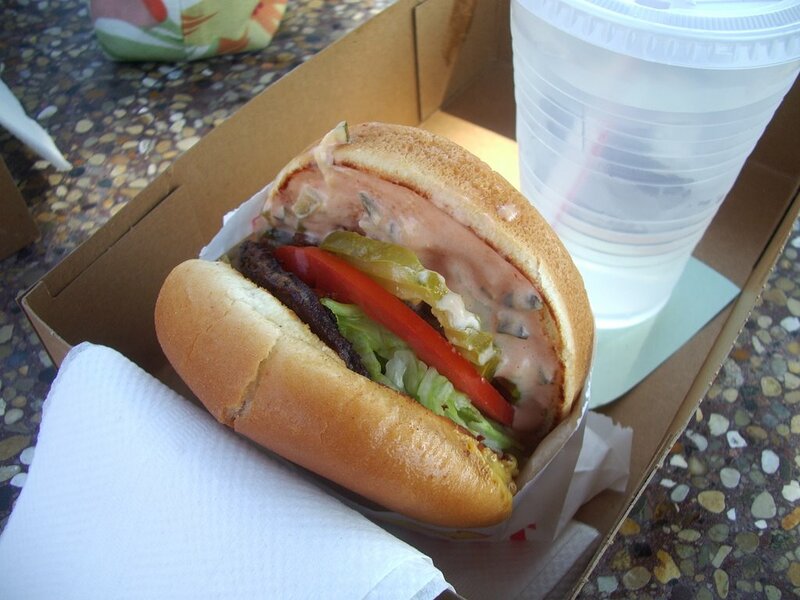 Well now that you’ve read my bit on burger eating, I reward you with…pictures from In-N-Out. Hooray! A friend and I stopped here for a quick Friday lunch. 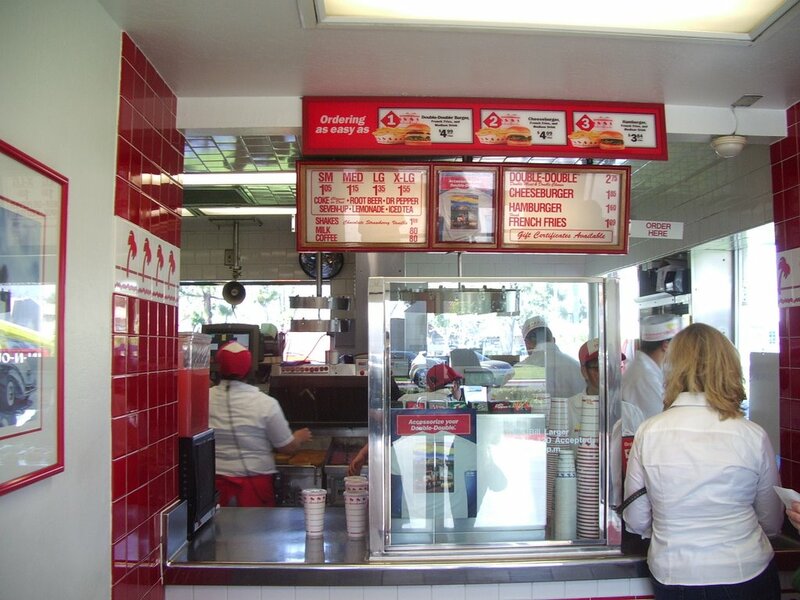 This was a particularly tiny In-N-Out, with nearly ten workers crammed inside a miniscule kitchen. I have no idea how they do it – I’d suffer from claustrophobia after working there for an hour. On our menu was the #2: Cheeseburger, Fries and Soda combo. Though better than average, their burgers are far from exceptional. The thin patty is always overcooked and dry (does anyone else think McDonald’s patties are juicer?) However they redeem themselves with buttery grilled buns. The buns are wonderfully crisp, borderline burnt around the edges and soft and spongy on the inside. I could just eat four or five buns as a meal. About the fries – these need to be wolfed down in the first two minutes of getting because the second they cool down the taste quality deteriorates very quickly. So whip out the ketchup, dip and eat while finger burning hot and you’ll be rewarded with deep fried crunchy sticks of goodness. We also ordered the Hamburger, animal style. For those unacquainted with their “secret menu” (which happens to be posted on their website, so much for secret! 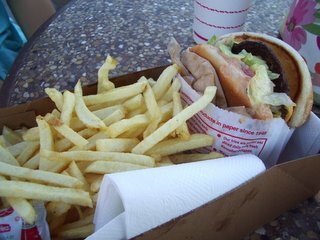 ), you can get any burger and request that it be made “animal style.” This means that your beef patty is cooked with mustard, served with pickles, a looot of extra mysteriously delicious spread and grilled onions. It’s the onions that does it. Onions on burgers (espcially when they’re slowly caramelized) make the world go round as far as I’m concerned. No milkshake today – but if you’re ever in the mood, I’m a strong supporter of the chocolate flavor! It’s toothachingly sweet but fun to eat like melted ice cream with a spoon. You’ll just feel kinda gross and fat afterwards. The verdict? It’s a fast food burger for sure, but I don’t feel like I’m succumbing to “fast food” when I come here because it’s a family owned chain that emphasizes quality and freshness. The extent to which they actually adhere to those principles is beyond my knowledge, but I’m more than willing to pay the extra money as long as my bun is grilled crisp on the edges! Exciting! Ok, I’m at college, live in a dorm without a kitchen and have no meal plan. There is no place within walking distance that’s worth eating at (these are the times when I really miss NYC) and I have no car. How do I eat? I make shopping trips on the weekends to the farmer’s market, nearby supermarket or Trader Joe’s. I end up eating at the school dining hall quite often due to a lack of time. Many nights I cook rice and have it with the Vietnamese pork chops, or other dishes and vegetables my grandma made in abundance and froze for me. Sometimes I make little sushi rolls, cone sushi, and because there’s an L&L nearby, the occasional delivery when I get homesick. Back to the present. I just finished my 4th midterm of the week and decided to reward myself by setting aside more time that usual to make dinner. A quick inventory of my fridge decided that good old fried rice was on the menu. While the brown rice was cooking, I chopped up half a can of Spam, washed spinach and sliced up shitake mushrooms. Sounds like an odd combo? Well it was what I had in the fridge! I took my hot plate from underneath the bed, borrowed a frying pan from the girl next door (also from Hawaii – note that we’re the only people on the floor with cooking equipment, thus Hawaii = Food) and started frying the Spam till it was nice and crispy. Added the mushrooms ten minutes later followed by the spinach and rice. You’re supposed to use old rice, but I didn’t have the patience to wait so I just used less water than normal too cook it. By the way, brown rice makes an awesome substitute for white when making fried rice. 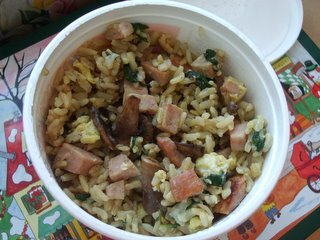 I was so happy watching the whole thing cook, the dark green of the spinach, little chunks of crispy Spam, the tender mushrooms and the mmmmm starchyness of brown rice that holds everything together. I got a lot of satisfaction from the fact that I was making this on the floor on a little campfire hotplate with no kitchen. A lack of kitchen makes it tough for me too cook. Hehe. I suppose it is for the better – I would never get any homework done if I had a kitchen right next to my room. Just before removing the rice from the heat, I beat in two eggs and viola! My dinner J This hearty meal was very satisfying, especially in the rainy weather. It even tasted semi-healthy (apart from the Spam). I added a splash of shoyu and polished off two big bowls. Well worth my time! I’ve never had fried rice made with brown rice before. I don’t usually put in spinach or mushrooms (or Spam for that matter) so this was a completely new dish for me. Surprising how delicious random ingredients thrown together with enthusiasm can taste, eh? I’m energized! Next up on list is the recipe for Puttanesca that appeared in today’s NYT. I just have to go find a dorm with a kitchen…don’t want tomato sauce all over my floor! 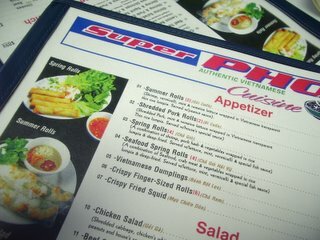 The name “Super Pho” spelled out in big bright letters would naturally lead one to question the quality of food served in this restaurant. But despite it’s tacky name and decor, Super Pho offers surprisingly decent dishes. The restaurant has gone through owner changes in the past couple of years, though the menu and prices (with the exception of a $.50 increase in pho) have stayed consistent. 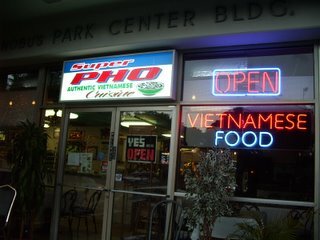 Our family comes here on nights where we are craving a steaming hot bowl of pho but don’t want to drive to Chinatown or pay the high prices at the neighboring Hale Vietnam. Though you can’t see it in the picture there’s Christmas lights hung around the entrance all year long – it’s a definite attention grabber! The menu is mainly Vietnamese fare with some local touches here and there. It’s hard to open a casual restaurant in the Kaimuki neighborhood without acknowledging the local palate. In addition to the traditional Pho and Bi Cuon, you can also get dishes akin to stir frys and fried rice found at chop suey places. 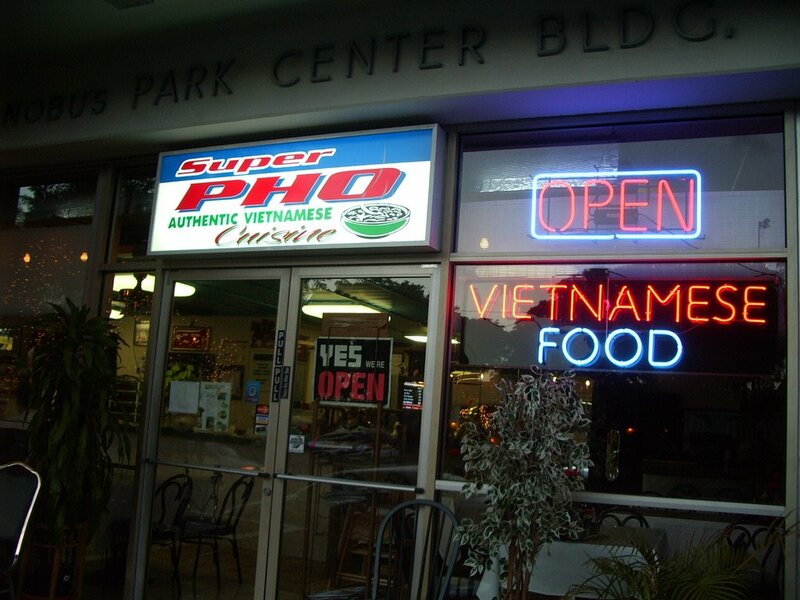 The food is Vietnamese for sure, but there’s a subtle local element (as well as shortcuts taken) to most dishes making it less authentic than we would like. 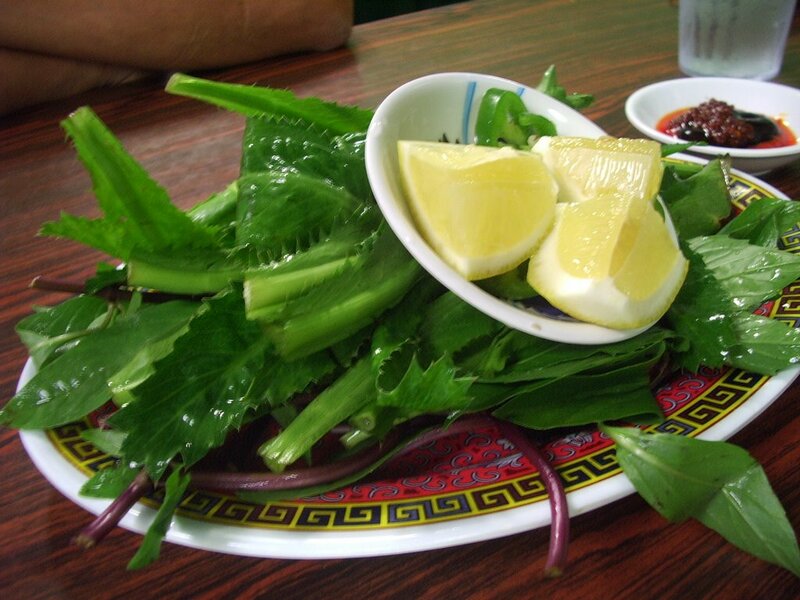 I always leave satisfied, though that may be due to the fact that my expectations are not set at a level as high as they would be if I went to Huong Lan or another spot in Chinatown. 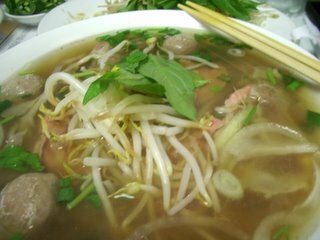 I just love that snuggly warm feeling I get everytime a big bowl of pho is set in front of me. Steam rising out of the bowl, the pleasing mix of vibrantly colors herbs and soothingly soft white noodles and a simple, clear soup, how could anyone not like pho? I suppose pho is my comfort food the way chicken noodle soup or grilled cheese sandwiches are to others. 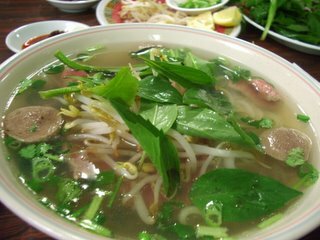 The pho broth here is beefy enough, though one may suspect that msg or other “unnatural” pho flavorings play a key role. They are slightly stingy on the bean sprouts and basil and even leave out the ngo gai on some occasions. I guess I would rather have no ngo gai than old, discolored ngo gai (I’ll refrain from mentioning the names of these restaurant which have sent out bad veggies for hope that it was just a fluke!) One thing you can’t complain about though, is the massive amount of noodles they give you. It’s seemingly bottomless bowl. Service is basic and friendly – owners have changed but the same waitress has been there for quite a while (she must know what she’s doing). Food comes in a timely manner and always at the perfect temperature. 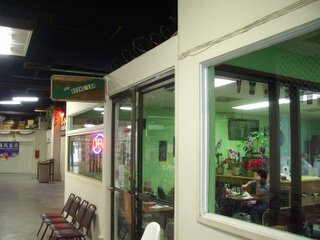 This quiet neighborhood stop is good for a low key family dinner, like Zippy’s, only Vietnamese! Our family used to go to To Chau for pho, but the lines were never worth the wait considering how many other good pho places we have in Honolulu. 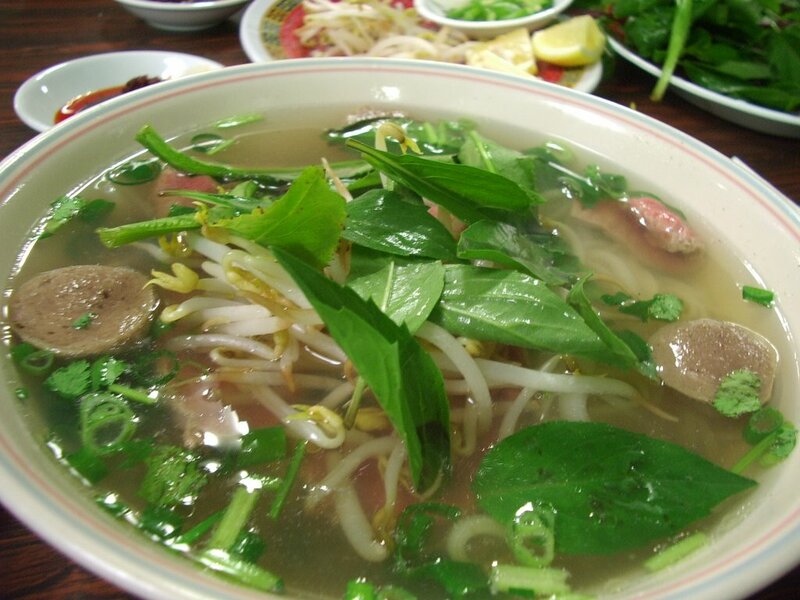 Pho Huong Lan in the Cultural Plaza, just a five minute walk from To Chau offers just as wonderful – if not better pho. The longest we ever had to wait here was ten minutes and that was only on two occasions. It’s one of the “cleaner” chinatown places and service is efficent with a smile. Even when it’s completely full, the ambiance is always calm and relaxed. Run by a local family for many years, it’s comforting to see some consistency/history is a world that, on occasion, seems to change too fast for me. I’m a firm believer that Huong Lan offers the clearest pho broth in town. Light and clean tasting, you can finish the whole bowl without that dehydrated, msg overload feeling. The soup is slightly beefy in flavor with a distinctive hint of anise. Just wonderful :) The tendon with addicting, perfectly balanced between crunchy and chewy, a pull that surrenders to a determined bite. I asked for the beef to be served raw on the side which allows one to see the quality of the meat. The generous serving of soft noodles are are waddled together at the bottom of the bowl, just waiting for you to unravel them into a spoonful completed by the savory, comforting broth.